The abacus goes by many names. It has a long and varied history. But so much has already been written about it and published on the web for all to see, there seems to be little point in me contributing some more. Romans. Research anything old and youll nearly always find something about the Romans. But the Roman abacus was astoundingly primitive. No rods, just grooves, which meant that it relied heavily on gravity, (pun intended). Still, it helped them count slaves and thats all that mattered. 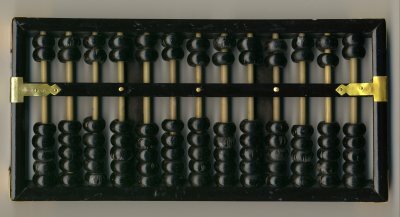 The Chinese abacus, (from which many cultures derive their own) is called the suanpan. It contains a number of rods, and a reckoning bar. The beads below the reckoning bar represent ones and are called earth beads. The beads above the reckoning bar represent fives and are called heaven beads. Each rod is asigned a base value, (for example hundreds, tens, units, etc). Each rod on a suanpan has five earth beads and two heaven beads. This gives the user the opportunity to count in base 16, or hexadecimal. This means you can use a suanpan to calculate computer hex. Although it stands to reason that if you have a need to calculate computer hex, you probably have a computer to do it for you. In fact, why would anyone want to use an abacus at all? The reason is a simple one: Its very good for your mind. The abacus is a remarkable tool that can be used to train the mind to perform astonishingly complicated mental arithmetic. For this reason it remains very popular in Japan. It is also increasingly used in parts the United States of America and India, where recognition of the benefits of the system is growing. Oh, and it doesn't need batteries. The Japanese abacus is called the soroban. The soroban is derived from the suanpan, but has been continually modified and streamlined. Heaven beads were decreased to just one at the end of the 19th Century, and the earth beads were decreased to four in the early 20th Century. The soroban is generally smaller than the suanpan, and the beads are shaped to make them easier to move quickly. The number of rods a soroban may have varies. Usually they have 21 rods, but for more complex problems it is necessary to have more.